Sugar substitutes have always generated a lot of questions, with most people wondering if artificial sweeteners are bad for them. In this video, Today Show nutritionist Joy Bauer shares her views on the various substitutes, how they impact weight and if they are safe. 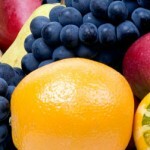 With weight loss on many a woman’s brain, limiting calories and certain types of food can mean not getting your fill of essential vitamins and minerals. While maintaining a healthy weight is important for optimum health, make sure your diet includes these important nutrients as well. 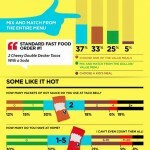 Check out this infographic from a recent survey by Lab 42 about the fast food eating habits of 500 guys. How do your habits stack up? My friend Suzanne Ausnit, a seasoned yoga instructor, is teaching another wonderful workshop ‘PLAY BALL’! Get on the ball through this fabulous self-care technique used by professional athletes and dancers to literally roll muscle tension out of your body. Looking forward to being fitter in the New Year? Yoga Boot Camp Intensive, With Lots of TLC (Tender Loving Core) combines elements of yoga, calisthenics, physical therapy and stress reduction.